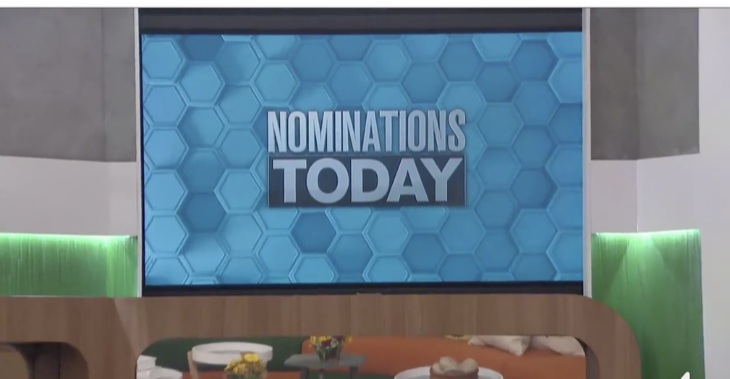 Swaggy C thinks that Tyler’s game is whacked with his nomination selections when he could have gone after one of the big threats. Tyler tries to reassure Sam that she is not the threat. Meanwhile, Steve says he is physically and mentally prepared. Tyler on the other and starts crying, he is turning on the water works so nobody will be mad at him. Crazy, the houseguests are falling for his act. Kaitlyn tries to give advice to Sam but she wants nothing to do with it and Tyler is worried that Sam is going to ruin his game. Steven speaks to Scotty, they have a connection because Steven has a good social game and Scotty doesn’t, although Steven thinks he is a beast. They both trust each other a 100%. Swaggy C is really connecting with Bayleigh, every night they stay up for hours and talk. Kaycee goes into the supply room and the pinwheel starts spinning, she can’t leave. Brett is feeling confident; he has a relationship with Angela, Rachel, Tyler, Kaycee, Winston and himself – they call themselves level 6 and Brett things they can make it to the final 6. Angela knows she is the target from the other houseguests, but she doesn’t care because she believes her alliance is rock solid. Sam returns to the house as herself and feels like an outsider. JC tells Sam off, he tells her that she is only focusing on the negative and needs to not give up. The houseguests enter the kitchen and there are cans of slop, Bayleigh refuses to ever eat it. There is a card, it reads that as head of household Tyler must choose the first four have nots to only eat slop, take cold showers and sleep in the most low tech have not bedroom in Big Brother history. Tyler asks for volunteers and Kaitlyn, Brad, Winston and Scotty put their hand up. Kaitlyn comes up with a name for her alliance, foute, meaning five of us to the end. Her alliance has Faysal, Rockstar, Haleigh and Swaggy C.
Time for an unexpected twist. All the houseguests were granted access to the BB App Store, each week America will answer a serious of questions to determine who is the top trending houseguest. They can be trending for any reason, good or bad, but they will never know. The top trending houseguest will be able to choose one power app inside the BB App Store which will grant them a special power in the BB game. However, the person who is least trending each week will choose a crap app which will inflict a punishment. Fayson is chosen as the least trending person and has to choose a crap app, he chooses Hamazon. He will receive packages all week long and every time he hears that there is a Hamazon delivery, he has to retrieve his package and prepare for a feast. He must eat all the ham in the delivery as soon as it arrives. Sam is the top trending houseguest and is floored tat she was chosen. She gets to choose from redraw, bonus life, upgrade, the cloud or identity theft. Sam chooses bonus life. This power gives her or the houseguest of her choosing the chance to return to the game if evicted. This power is good through the first four evictions. But here’s one catch, if the Bonus Life is not used at one of the first three evictions, the 4th person evicted automatically gets a chance to return to the game.